If you’ve ever fancied yourself as a mad scientist if liquor libations, but are sane enough to acknowledge you lack the chemistry skills to back up those nefarious ambitions, then consider the absinthe blending kit Liquers de France brought to market this month. For a mere £75.70 plus shipping, you can equip yourself with six vials of herbs distilled in 120 proof alcohol, including the belle of the ball, artemesia absinthium, as well as her two sisters, green anise and sweet fennel. These three alone (in addition to a blended distillate of commonly used coloring herbs, which is also included in the form of an “Esprit Vert”) would be enough to concoct a pontarlier-style absinthe ala Pernod Fils, but you also receive distillates of coriander and hyssop. If you’re feeling even more ambitious, there are three other distillates available separately, included star anise (badiane), angelica, and genepi. My mysterious lady-love S—- and I have been playing with these for the past month, and it’s been quite a face-puckering learning experience to be able to smell and taste these distillates individually (and at full strength) for the first time. For anyone who is serious about learning to differentiate between flavors and aromas while tasting and scoring absinthe, this kit is a treasure, because the organoleptic properties of herbs before distillation are oftentimes quite different than afterward. While you might be able to find a few of these herbs in an essential oils store or alternative medicine shop, to my knowledge, this is the first commercially-offered set of absinthe-specific herbs distilled in appropriately high-proof alcohol. 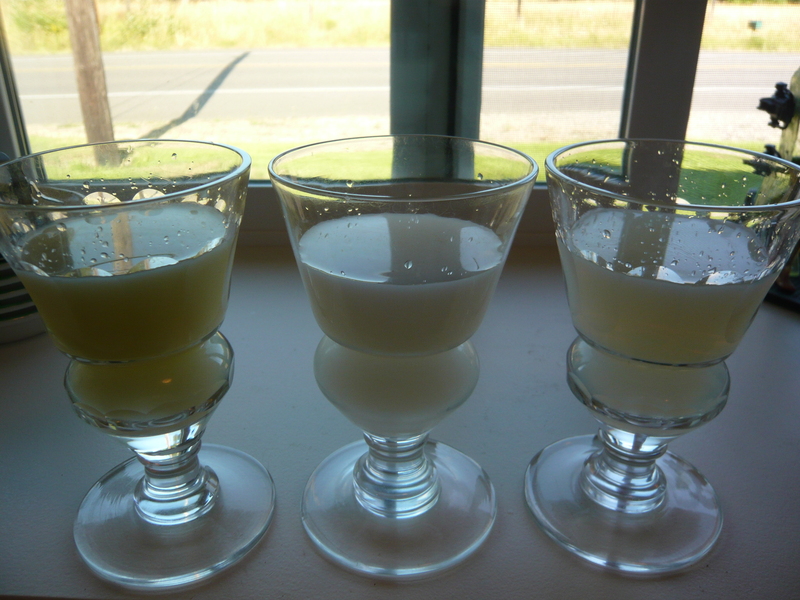 answer that question, I decided not to pull any punches and went straight for the toughest gauntlet I could throw down, which was a taste-test comparison with two of my favorite absinthes. As it turned out, this distillate kit had exactly the herbs needed to produce a Montpelier-style absinthe (based on a 19th-century recipe documented in both the Duplais and Bedel distillation manuals), and I happened to have on hand absinthes from two different distillers which used the exact same Montpelier recipe – Pacifique, and an unnamed Montpelier-style absinthe. While the exact composition of the Esprit Vert included with the kit was a trade secret, I have it on good authority from folks involved in its production that it is a fairly traditional blend of coloring herbs used in classic absinthes, so this was a rare opportunity for a fairly accurate horizontal taste test. individual herb distillates in the correct amount, I added the Esprit Vert. Given that this proprietery blend was already the peridot-green color of a good absinthe verte before being combined with anything else, I was not surprised to see that the resultant mixture was a very pale golden-green. The Pacifique was lighter in color than the unnamed absinthe, but the gap between those and the LdF blended absinthe was even wider and more noticeable. There are two primary reasons why a coloring mixture would be too light: either there weren’t enough herbs used for the amount of alcohol they were macerate in, or the herbs were not allowed enough time to macerate in the alcohol. Given that quality herbs are very costly, herbs are very costly, which is the primary reason why a good absinthe is much more expensive than a good liquor of almost any other sort, I’m guessing that the former reason is applicable here. If star anise is present, restraint was shown in the amount used, and the louche was robust in the way that a Belle Epoque absinthe ought to be without skewing the flavor too much. That being said, I would prefer that star anise not be present in the Esprit Vert, since particular recipes (such as the Montpelier one) do not include it. 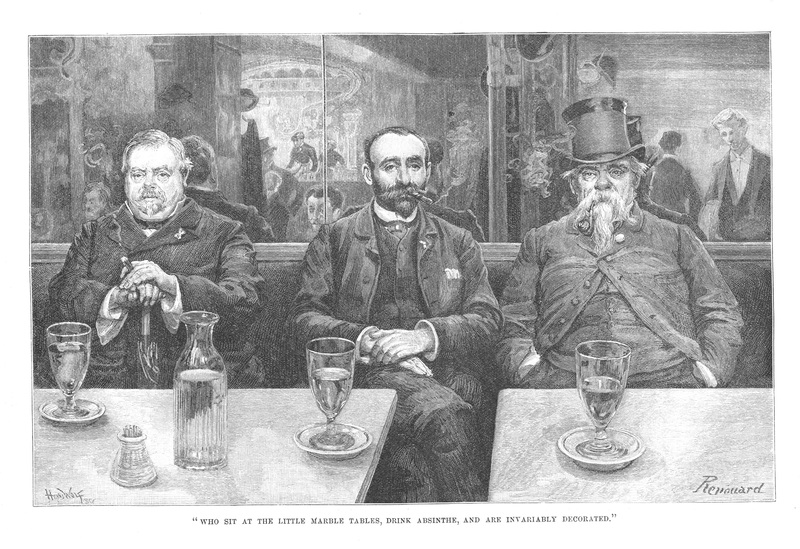 Possibly as a result of the different coloring herbs and/or a difference of aging (for which the LdF absinthe had none), the Pacifique and the unnamed Montpelier-style absinthe had much in common, while the LdF blended Montpelier shared only a few similarities. All in all, I’m very pleased with this kit, both in terms of the educational value, as well as the fun of being able to mix up my own absinthe with pleasant results. In the future, I’d like to see a richer version of the Esprit Vert included with the kit, and it would be excellent if they made available distillates of other herbs frequently used in absinthe, particularly lemon balm (melissa), pontica, and veronica. As it stands, this initial kit offers plenty of options to experiment with in the chemistry lab of your own kitchen, and you don’t even need to fire up a Bunsen burner. Since we all know that flame has no business being around finished absinthe anyway, that is a definite plus. As one or two of you may have noted in the comments section of one of my previous blog posts, I recently purchased a sealed bottle of vintage Pernod Fils Tarragona. While the Tarragona operation in Spain was originally started by the Edouard Pernod distillery around 1910 in order to escape the Swiss and (soon to come) French ban on absinthe, the operation was absorbed by the larger Pernod group sometime around 1938. 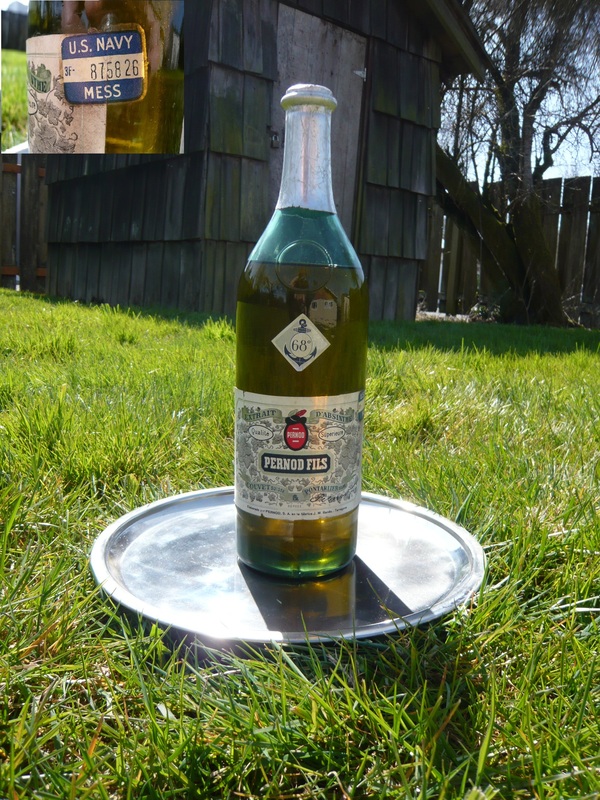 At this time, the recipe appears to have changed from that of the spicier Edouard Pernod, to the more floral and somewhat “feminine” Pernod Fils recipe, and continued on in that vein until 1960, when a new master distiller and new recipe resulted in a drink which more closely resembled pastis. Now, exactly how does a Spanish bottle of absinthe (a liquor which was still banned in the United States) wind up in the galley of some U.S. Navy ship or commissary? While a relaxed “when in Spain, do as the Spaniards do” policy would likely have been a welcome change of pace for some service members, members of the U.S. armed services are almost always prohibited from engaging in activities which are legal in their host country but illegal back in the United States. However, in addition to absinthe’s legal status in the U.S. being in limbo during this time period (though not for Spain, as it was never banned there), an even more interesting fact turned up in my research on the origin of this bottle. As part of Franco’s attempt to improve international relations and create ties with the U.S., a naval base was created in 1953 in Rota, Spain, which was administered by a Spanish Rear Admiral, but completely funded by the United States and staffed with American servicemen of all branches of the U.S. military. It remains in operation to this day, and I suspect that my bottle of Pernod Fils Tarragona earned its “U.S. Navy Mess” sticker from this exact location. But on to the really good stuff. By now, you’re probably may be wondering if I let this green genie out of the bottle, and yes, as a matter of fact, my lady love and I did open it yesterday. Special occasions are wonderful things, but sometimes a person’s expectations get blown out of proportion during those times, and so we waited for a day that just seemed like a good time for a Spanish absinthe, and yesterday was that day. The fact that it was Mother’s Day was simply a coincidence, which is just as well since both of our mothers would happily decline a glass of absinthe. (Thankfully, there are flowers, books, and tea to be given in its stead). So how did this absinthe rate? It was like a taste of liquid sunshine. Not the ‘60s acid trip kind, mind you, but rather the metaphorical kind; it was bright and warm, full of the taste of the famous green anise of Spain while still being anchored by a very fine wormwood. Of all the absinthes I’ve tried, this was the first that tasted noticeably better when sweetened with cane sugar instead of agave nectar. That could be because the Tarragona is fairly sweet to begin with, or possibly because this recipe produces a more delicate liquor; regardless of the reason, the agave nectar didn’t smooth out sharp edges (of which there were none) so much as smear the subtle herbal nuances of the flavor. However, it would be a mistake to think that this absinthe was too weak or delicate to stand up to a good watering; I found that it hit it’s peak at approximately a 4:1 ratio of water to liquor. While the louche activity tended to stay at the bottom half of the glass for most of the prep time, it was very active and cloudy there in the deep before storming up and overtaking the entire dose near the end of the watering for a spectacular final louching. The very high level of activity is no doubt due to the addition of star anise in a slightly higher amount than in previous decades of the Pernod Fils Tarragona, and my guess is that the action stayed at the bottom of the glass because I was using a carafe with a very thin but forceful stream, rather than dripping water into the glass. The aroma was very pleasant, if not quite as room-filling as I was expecting it would be. As with the louche, the fragrance was playing hard to get until near the end, but the reward of leaning in for a whiff was that of an alpine bouquet resting in a field of green anise. Overall, traditionalists might be a little bit disappointed that the alpine overtones are not as sharp or crisp as a Belle Epoque-style absinthe, but I found this one to be a pleasant and balanced bridge between the French/Swiss absinthes of the 19th century, and the more modern Spanish absentas which have a much stronger profile of green anise. It earns a full 10 points from me. Well done, Mr. J. M. Bañas!